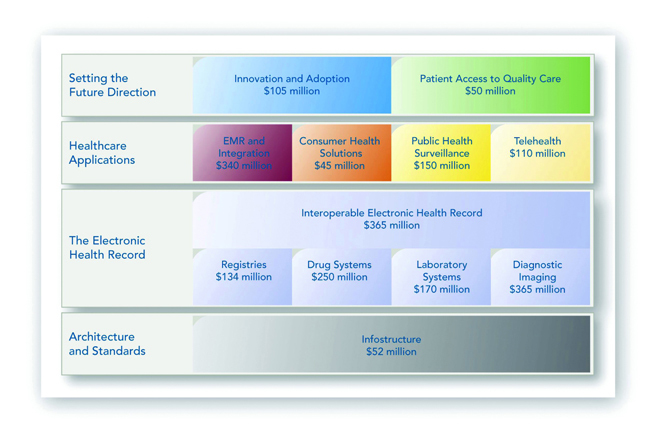 What happened to the last billion dollars in health information technology? Health information technology (IT) is not one of those investments that a government can display in the shop window at election time. Its selling point is the health-system transformation it can help bring about: that vision of a patient-centric system with collaborative teams, better access and evidence-based care, where data is captured and used for education, monitoring and continuous improvement. However, these changes generally take more time to implement and consequently the benefits tend to take longer than many other short-term initiatives governments may want to pursue during their three- to five-year tenures. With that being said, the benefits of health IT — in access, quality, productivity, cost savings and economic growth — appeared compelling enough to convince our provincial, territorial and federal governments to come together and create Infoway in 2001 so as to spur and coordinate health IT investment. Canada Health Infoway is an independent corporation owned by the provinces, territories and federal government. It began with federal funding of $500 million and today has about $2.1 billion in capitalization. 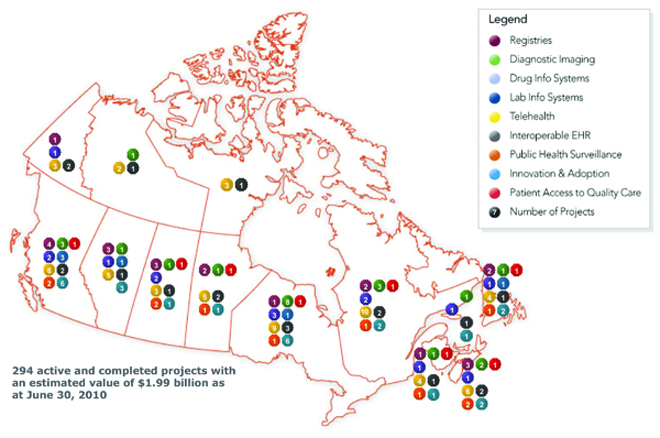 Figure 1 depicts projects initiated as of June 2010. A few studies have been important in assuring ongoing funding. 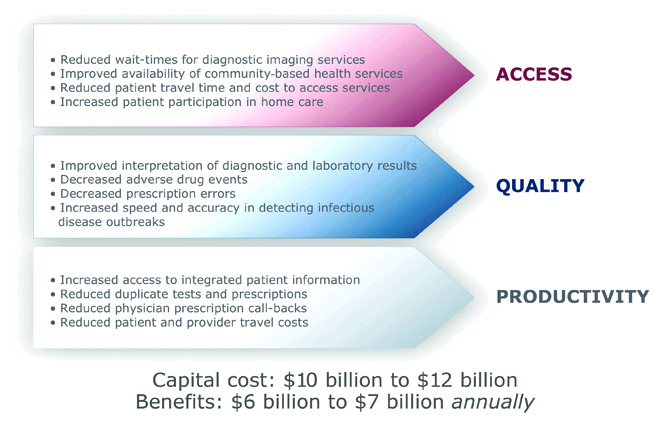 One study, conducted for Infoway by the consulting firm Booz Allen Hamilton, found that an investment of $10 to $12 billion in health IT in Canada (out of a total healthcare budget of $180 billion) would bring return-on-investment benefits of $6 to $7 billion annually in access, quality and productivity (see Figure 2). Reducing adverse drug events would not only save the system a lot of money, but also potentially save many lives. Reducing the duplication of tests (which now account for about 10% to 15% of activity) would make our care providers more productive and help assure sufficient capacity to reduce wait times. The Conference Board of Canada studied the impact of health IT investment on the economy and found that for every $100 million invested, some 1,500 jobs are created, half of which are IT knowledge-worker positions. That $100 million would also generate some $42 million in pre-tax corporate profits. In addition, for every dollar spent by Infoway, $1.34 is added to Canada’s gross domestic product (GDP). The first Board of Directors made a number of decisions about the conditions under which Infoway would invest in an IT project in order to improve the likelihood of benefits. Rather than spread money evenly across the country, its members decided to focus on jurisdictions that were ready to invest. They also decided that jurisdictions had to have a financial stake in the project. The formula was originally a 50-50 investment by Infoway and the jurisdiction. When I joined in 2004, it was apparent that jurisdictions were struggling to meet their matching contributions and consequently money and progress were somewhat stalled. Therefore, we increased Infoway’s contribution to 75%. The Board further decided that Infoway should operate not as a granting institution but as a strategic investor, which basically means ‘no deliverables, no money.’ After Infoway signs a contract with a jurisdiction, a 20% signing bonus is given. Another 30% is handed over once the systems are in, but 50% is held until there is actual uptake of the system. The greatest fear is always that we are investing in building systems that may not be fully utilized. It was also considered important to leverage investment and not ‘reinvent the wheel’ repeatedly. At one point, it seemed that if hospital A had one IT system, hospital B would deliberately buy a different one, regardless of the fact that patients and doctors moved between hospitals. We insisted on replicating at minimum the standards, and at maximum the whole application from one jurisdiction to another. That has now been done with aspects of drug systems in Alberta, Saskatchewan and Québec. Given the potential pitfalls of investment in health IT, measuring the benefits is especially important. Very early on, Infoway brought in a blue-ribbon panel of researchers from across the country to build an evaluation framework that we use to assess the benefits of projects in which we have invested. Finally, Infoway formed strategic alliances with private vendors and worked to show them where the puck was heading: which jurisdictions were ready to invest, what standards would be applied, etc. Infoway has invested in 12 targeted programs, (see Figure 3). The bottom bar involves the bedrock: architecture, standards and infrastructure. In the second bar are projects related to the electronic health record (EHR). The EHR is the aggregate electronic record of health-related information on an individual that is created and gathered cumulatively across a number of healthcare organizations. Specific EHR programs were developed with input from focus groups with clinicians across the country. They pointed to patient identifiers, drug histories, lab results, images and reports as elements that would enable more accurate and faster diagnosis. The third bar up contains four different applications that are receiving increasing attention: electronic medical records (EMRs), which differ from EHRs in that they contain health-related information on an individual that is created, gathered, managed and consulted by clinicians from a single organization or office; consumer health solutions; public health surveillance systems; and telehealth programs. In the top bar are innovation and patient access programs that can show real benefits to residents of a region in a shorter time frame. Canadians use some 40,000 points-of-health service, all of which keep information about patient visits. Infoway’s basic aim is to bring that information together. Infoway designed a systems-oriented architecture for the EHR that is very similar to the architecture employed in the banking system. There are points-of-service and information repositories, and means of linking these together. Many manifestations of this architecture are possible, depending on the size of the province and what it already has in place. In Québec, we proposed building on the regional networks, such as those being implemented at the McGill University Health Centre, Centre hospitalier de l’Université de Montréal, Centre hospitalier universitaire Sainte-Justine and Centre hospitalier universitaire de Sherbrooke (see Figure 4). It was suggested that Québec will likely have three regional networks. The boxes labelled “condos” in Figure 4 would be the three or four hospital information systems through which it becomes possible to link the lab, drug and diagnostic imaging records, thus enabling the clinician to have a complete view of a given patient. Then we can start to integrate the systems. In 2004, there were about 50 projects across Canada and about $125 million approved but not necessarily spent. Today, we have nearly $2 billion approved with not even half of that actually spent (see Figure 1). A couple of provinces have made terrific progress. A utopian view of the EHR is now available in Alberta and PEI. Across Canada, 70% to 80% of x-rays are now digitized; unfortunately, all of these are in the public sector. This creates problems in Ontario where a huge private imaging sector remains film-based. Lab systems are coming on stream, but a lot of the activity is at a local level among distributors. There are many projects in the mix right now, but, for a variety of reasons, some are very slow in delivering results. We now need to make the move from projects to results and demonstrate improvements in such areas as patient safety, quality of care and management of chronic disease. British Columbia’s (B.C.) Pharmanet drug dispensing system captures every prescription dispensed in B.C. and provides alerts to pharmacists and physicians. In 2007, Pharmanet had 47 million prescriptions and identified some 2.5 million significant drug interactions. Similar systems are being implemented across Canada. If we extrapolate B.C.’s results to the whole country, we can expect to identify 55 million inappropriate prescriptions and around 20 million significant drug interactions annually. In October, we published a study on the benefits accrued from drug information systems now being used by about 50% of pharmacists across the country, both in hospitals and the community. The benefits ranged around $436 million in 2010, with high benefits coming from increased productivity of pharmacists, reductions in adverse drug events and improved medication compliance. When drug informations systems are combined with e-prescribing, potential benefits could reach about $2.3 billion annually. Digital imaging enables clinicians in urban centres to review x-rays and scans of patients in rural areas immediately, reducing the lag time for diagnosis and the need to travel. To date, we have achieved 76% digitization in Canada. This will generate up to $1 billion in savings across the country. Digital imaging brings a 25% to 30% increase in radiology productivity, the equivalent of adding about 500 radiologists. Today, communities north of 60 are telehealth-enabled or in the process of becoming so, and we are on track to get 40% of First Nations communities telehealth-enabled, with a focus on mental health and drug addiction services. There have been tremendous advances both with the Ontario Telehealth Network, which enabled over 32,000 clinician consultations in 2007, and programs here in Québec. Infoway is investing in Web-synoptic surgical reports as innovation projects for quality improvement. The idea is to replace the traditional narrative record of the surgery with a templated electronic form. The surgeon completes this form by choosing key words to record clinically significant elements, and uses in it teaching, peer review, best practices and quality assurance. The Alberta Cancer Board found that surgeons using narrative reports were missing 53% of data and that reports were submitted more than a month after surgery 85% of the time. The Cancer Board asked surgeons to identify key mandatory items to capture and built a synoptic record around those events. Now, 90% of reports are available within an hour of surgery and 100% of the mandatory items are present. Use of Web-synoptic reporting has spread from Alberta to other jurisdictions, as well as to other areas of surgery. Alberta is ahead of the curve with some 20,000 clinicians using EHRs in different ways in their practice. The EHR allowed them to create chronic disease management registries quickly. In doing so, they found diabetes to be much more prevalent than they had thought. This led to Alberta changing the way these patients are managed; nurse practitioners were employed and individuals encouraged to take an active role in their own care. The registry contains data on 14,000 diabetic patients; 63% of these have achieved optimal control compared to the national average of 51%. 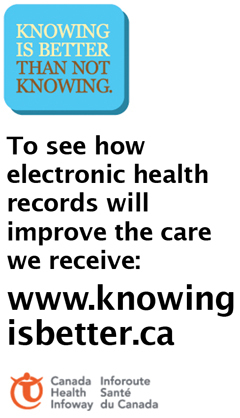 In 2006, there was a call to action for 50% of Canadians to have an EHR by 2010 and 100% by 2016. The $500 million in additional federal funding included in the 2009 budget is certainly helping us near this goal. The funding was meant to contribute to EMRs, clinical system integration, consumer health solutions and secondary use of data. We can expect a big push to implement EMRs in doctors’ offices. Denmark and the U.K. have had almost universal implementation for years. Canada lags behind with only between 30% and 37% of doctors using EMRs in their offices. Six provinces are gearing up implementation and Québec is about to do so, but we want to make sure that office systems do not become isolated pockets of information. 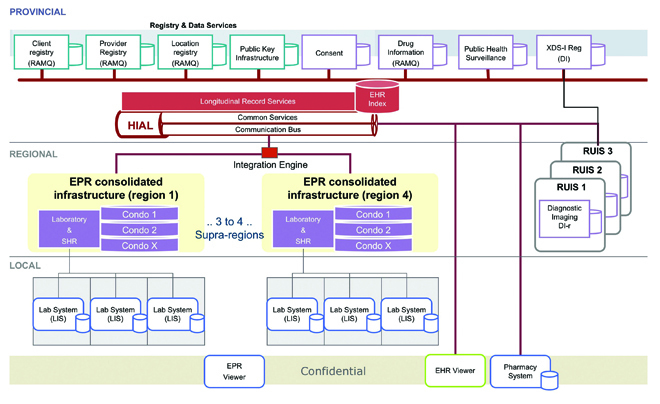 If investments have been made in a province’s drug information or discharge notice systems that can be connected to these EMRs, then we would invest in the required integration systems. Consumer health solutions are clearly the future of health IT. A study just published by Kaiser Permanente found that consumers do not actually want access to all their health information, because they would not know what to do with it. They do want access to their lab tests — something B.C. has started doing; they want to be able to obtain prescription refills online from their doctor; they want to be able to schedule their appointments and receive e-consults. Infoway will be working with jurisdictions and regions to see what it can contribute. The challenge here is not technical, but rather related to culture and compensation. Use of health IT databases in research holds phenomenal potential, and Infoway will be working to develop the requirements for beginning to do this. As we define or enhance the specifications for the EMR, we want to be sure that the databases employ structured as opposed to textual data so they can contribute to advances in clinical trials and research. Much sacrifice has been made across the country to support health IT initiatives. The heat is on to deliver interoperable solutions that truly facilitate care and guard against privacy and security breaches that could compromise acceptance. We are getting slower than expected clinical uptake because clinicians have not been involved and do not feel that they are getting much value. We do not have enough skilled human resources. In some cases, funding is slow to come. If a provincial premier is not supportive, the province will have real problems with funding. If health IT is not a priority for a health minister, projects in that province have no chance of moving ahead. When we conducted focus groups with members of the public, it became apparent that education was needed about the potential for EHRs to truly improve health care. People regarded them as just an administrative tool, but their views changed dramatically when we explained the potential benefits. We have to educate the public and build the social capital we need to convince our political leadership to see the project through to the end. Infoway embarked recently on a TV, print and Web campaign, under the slogan “Knowing is better than not knowing,” to show people how it used to be and how it could be. The Web site provides a good explanation of how your data can get stranded as you move around the system and why it is important for it to come together. Mr. Alvarez is a leader in Canadian health care. He is known for taking on challenging mandates and building successful organizations. As President and Chief Executive Officer of Canada Health Infoway, he has been a catalyst for accelerating the development of electronic health records in Canada. He has established strong, collaborative relationships with the federal, provincial and territorial governments and other stakeholders as the foundation for solid progress. He has articulated a broad national vision for reforming Canada's health care system through innovation and technology. On the international front, he has helped to position Canada as a world leader in health care renewal. Mr. Alvarez earned the Institute of Corporate Directors certification at the Rotman School of Management. In 2007 he was recognized as the 2007 National Builder Inductee to the Canadian Information Productivity Awards (CIPA) Hall of Fame for the leadership he has exercised throughout his career (with the Government of Alberta, the Canadian Institute for Health Information and at Infoway) in promoting the application of innovative technology to improve health care delivery for Canadians. Prior to his role at Infoway, Mr. Alvarez also played a key role in harnessing the power of information to improve health care. As former president and chief executive officer and ex-officio board member of the Canadian Institute for Health Information (CIHI), he helped CIHI evolve into a well-known and respected organization with strong ties to the research community. Mr. Alvarez is a frequent speaker and facilitator at national and international health care conferences and is a past recipient of the Who's Who in Healthcare Award. He is a Board Director with Ontario Health Quality Council and an honorary member of the C.D. Howe Institute Health Policy Council.